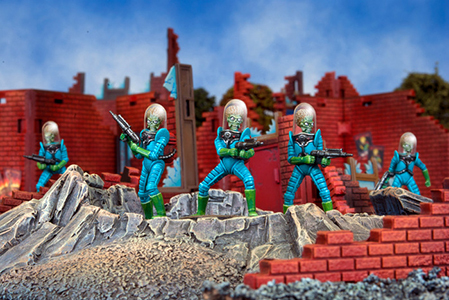 While much of the world was waking up, Mantic Games launched a Kickstarter campaign to raise funding for Mars Attacks - The Miniatures Game. Within 15 minutes, the $50,000 goal to make the game happen was met. Within three hours, it had soared past $100,000. And there are still 37 days to go. The Kickstarter campaign has plenty of different levels to pledge, each with its own set of rewards and incentives. Like any of those PBS pledge drives, the more you give, the better the swag. The low end of the spectrum starts at $10, which comes with a digital copy of a rulebook for a game you don't have. For $15, there's a set of exclusive Topps cards that won't be available anywhere else. Included are four cards with all-new art and a fifth with artwork from the game. Should funding get high enough, an extra card may be added. Pledging $100 or more gets backers a copy of the game plus a variety of add-on credits that can be used to get more miniatures, additional scenery and other accessories. 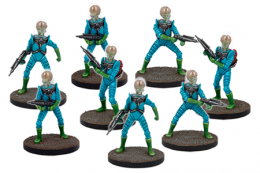 Mars Attacks - The Miniatures Game is similar to a two-person board game. Players embark on different missions and challenges. Story lines are drawn from the Mars Attacks cards and comic books. The highlights are the detailed plastic figures. Straight out of the box, gamers have a Martian army and other human counterparts. Each game has eight Martian soldiers, eight US soldiers, a Martian general and three humans. As more money is pledged, more figures will be unlocked. So even if the game isn't your thing, they can act as a display piece. While the figures come assembled, they are not painted. This adds a level of customization for those who want to show some artistic flair. The Mars Attacks - The Miniatures Game Kickstarter campaign ends on Sunday, November 10 at 7PM EST. Because it has already met its goal, all pledges will go through. Shipping for rewards is free in the United States and the UK but requires an added shipping fee for other parts of the world. Full details can be seen on the game's Kickstarter page. Games are expected to be ready to ship next August following final production of the game. 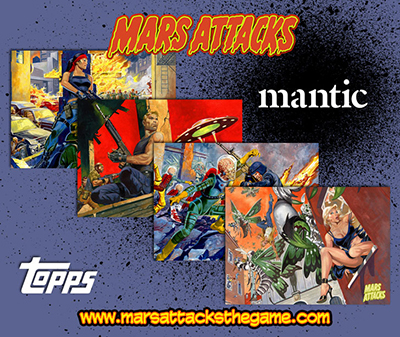 The launch of the Mars Attacks game comes shortly before the release of 2013 Topps Mars Attacks Invasion, the first completely new set of trading cards for the franchise in more than 50 years. 2007 Topps Transformers Movie hobby sealed 8-box case Megan Fox auto?